Why It's Taking Me Forever To Finish Consuming Jazzhole's "Poet's Walk"
It's good to know friends in low places. I've known Jazzhole mastermind Warren Rosenstein since 1995, when the group released their critically acclaimed CD, . . . And the Feeling Goes Round. It's been hard for us to keep in touch with one another through the years because both of us are so busy. Whenever Jazzhole releases a new album, without fail Warren always sends me a fresh CD copy in the mail. What a cool guy. I also treasure the fact that Jazzhole are truly a GREAT live band as well. In the last few years, crooner Marlon Saunders has been part of the fold and has given the group its soulful sound. Their latest CD, Poet's Walk, was recently released in the U.K. and will hit U.S. stores on July 11. 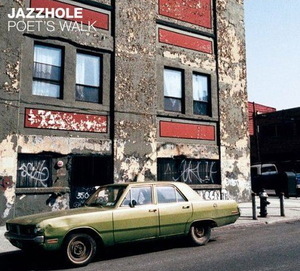 Poet's Walk is a great collection of wonderful jazz-soul music. It's a perfect album for the summertime. I will write a more detailed music review and post it on my blog Beats and Rants near or around the July 11 release date. In the meantime, check out a few selections from Poet's Walk, right HERE. My Favorites: The excellent remake of Boz Scaggs's "Lowdown," the tender ballad "The Slipping of Time" and the smooth jazz sounds of "Timeless."